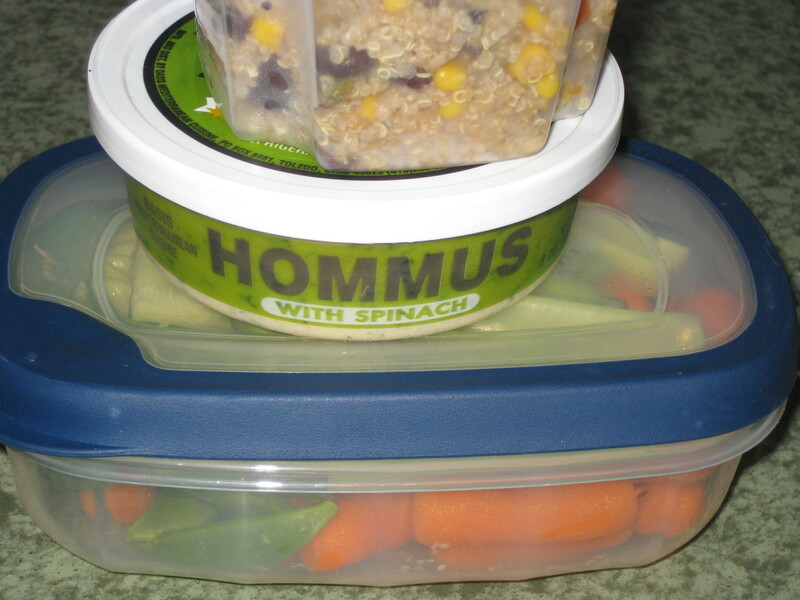 Lunch today was the same as yesterday: leftover quinoa, veggies and hummus, and Greek yogurt with All Bran. It filled me up, until my snack at 3pm – a Zone bar. After school, I was tired but decided to go to the gym for another workout. I have been slacking lately and had time to do some weights this afternoon. Upper body weights – 30 min. I was excited for dinner when I got home. We have planned our menu for the week and it was taco night. 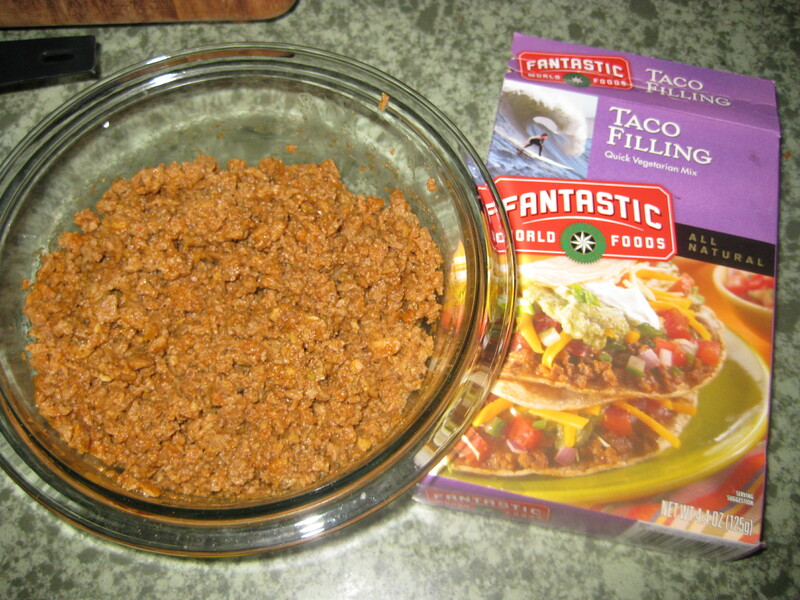 I was sick of chicken lately, so I decided to try some vegetarian taco filling. I have had the nature burger and the veg. chili made by fantastic foods, so I figured this would be pretty good! It is very easy to make, just add water ( I omitted the oil it called for), and microwave! When it came out it looked a lot more like meat than I thought (I think I may be able to pass it off as ground beef in a taco for Brady, I’ll have to try next time :). 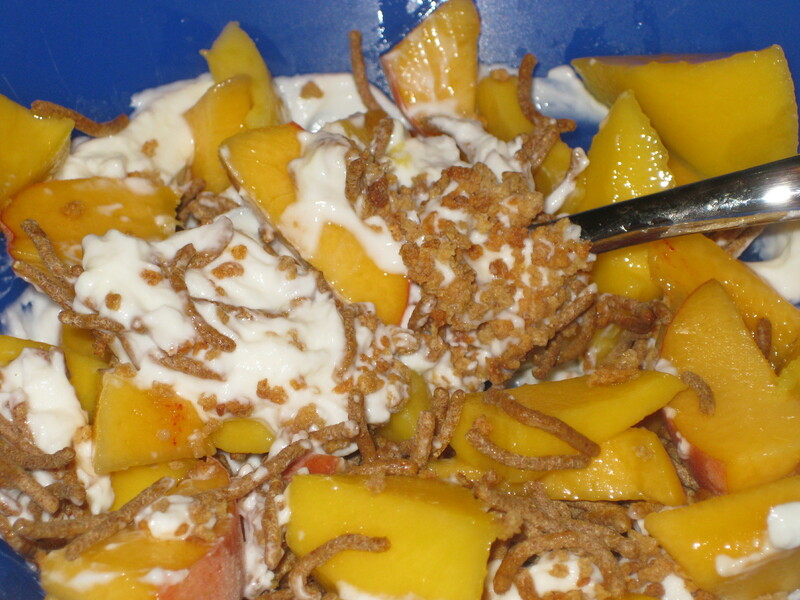 And on to dessert: A Greek yogurt parfait with All Bran, peaches, and mango. I think I have had a post with this title before…probably after a similar indulgent weekend. Anyways, I am back on track, again. I am sure this will happen again, but that’s ok, right? 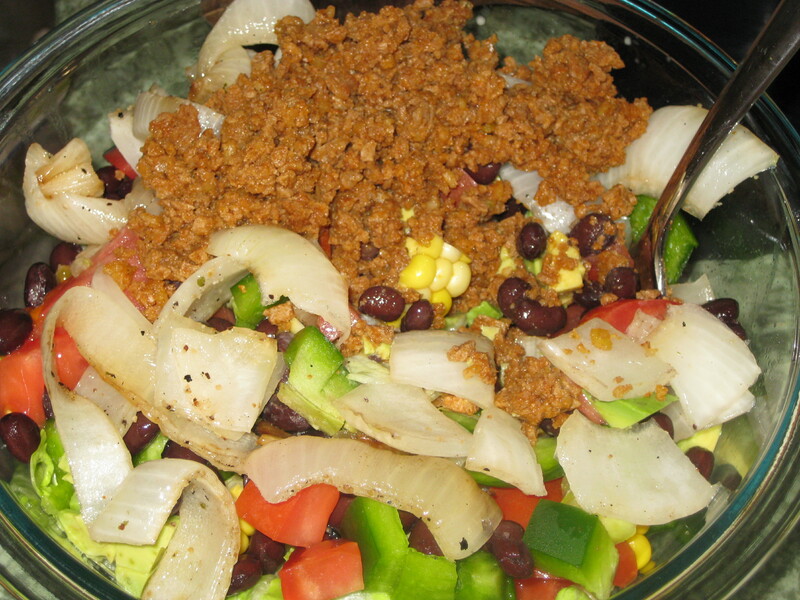 We are trying to use some of the things in our freezer, so this morning I used some GimmeLean soy sausage. I had never tried it, but it was really good! It has no fat and only 60 calories per serving. 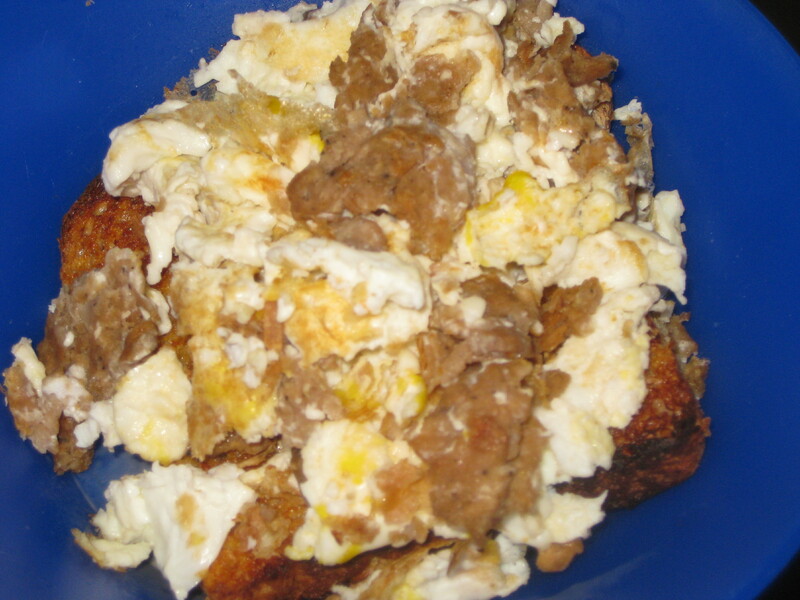 I mixed it with 2 egg whites and ate it all on a piece of sprouted wheat toast. It was not a pretty meal. Actually, it is a lot more gross looking that I thought. Sorry. I needed something sweet so I made a mini yogurt peach parfait! 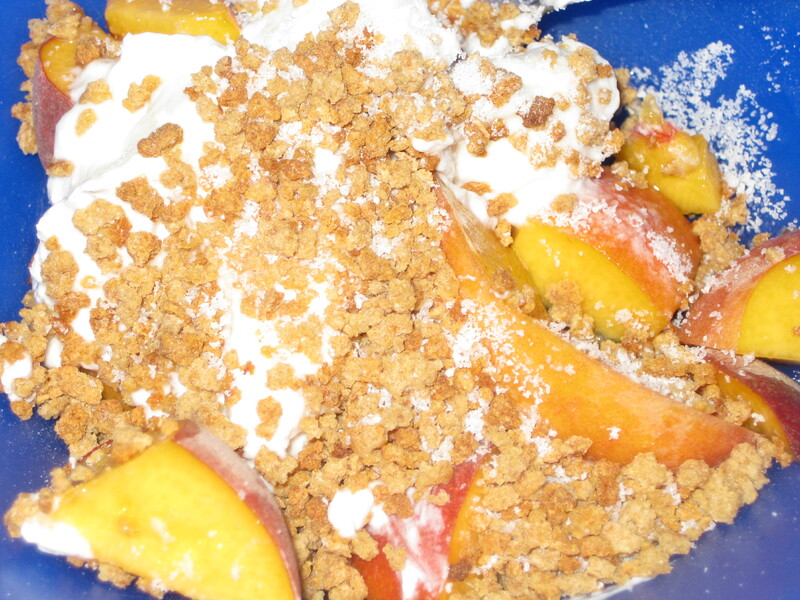 Use this to top the sugar cookie cake and add tons of fresh peaches. A big thanks to my mom who sent me (my brother brought them down) a huge container of peeled and sliced peaches. This morning I got up and got ready for school while Brady was getting ready for work. It really felt like summer is over. 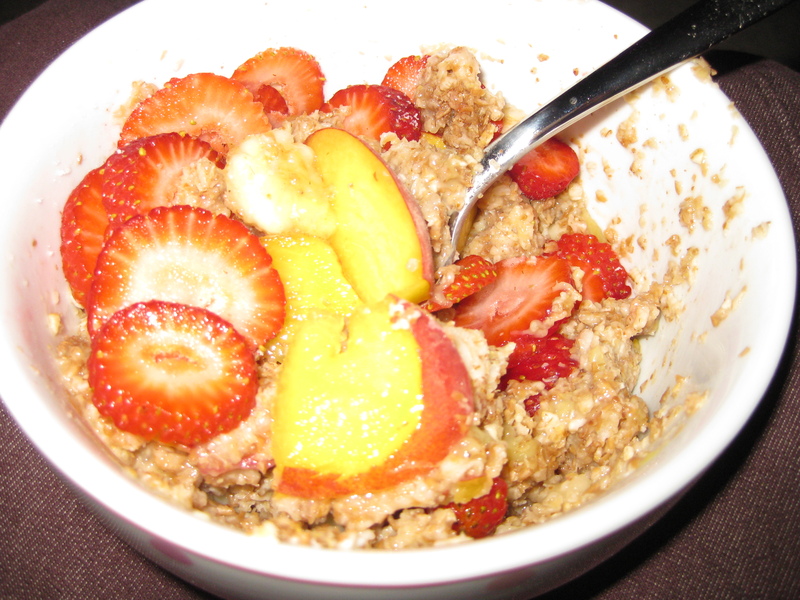 I had a big bowl of oatmeal which should keep me full for long time while I work on my room! We ate our breakfast while watching handball. What a crazy sport!? I tried cutting up my peach and mixing it into the banana oatmeal before microwaving it to see if it would melt like the banana. It did and it tasted great – sweet and fresh, kind of like Quaker Peaches & Cream but completely nautral and better for you! This morning I didn’t do my usual routine which has been to wake up and run outside then eat breakfast. I had a few errands to run so I wanted to get those out of the way. Now I am regretting my decision to skip the run. I am going to have to squeeze it in later when it’s hot…Yuck! I did enjoy my breakfast though! Since it wasn’t a usual morning, I decided against having my semi-usual breakfast. Instead I toasted 2 slices of Trader Joes Sprouted Wheat bread and covered then with 1 tsp. 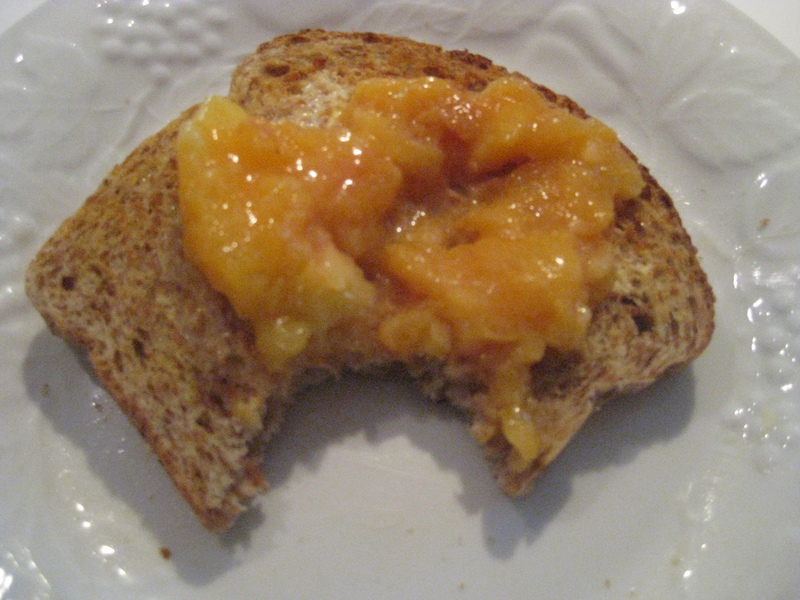 each of natural peanut butter and some homemade peach jam. 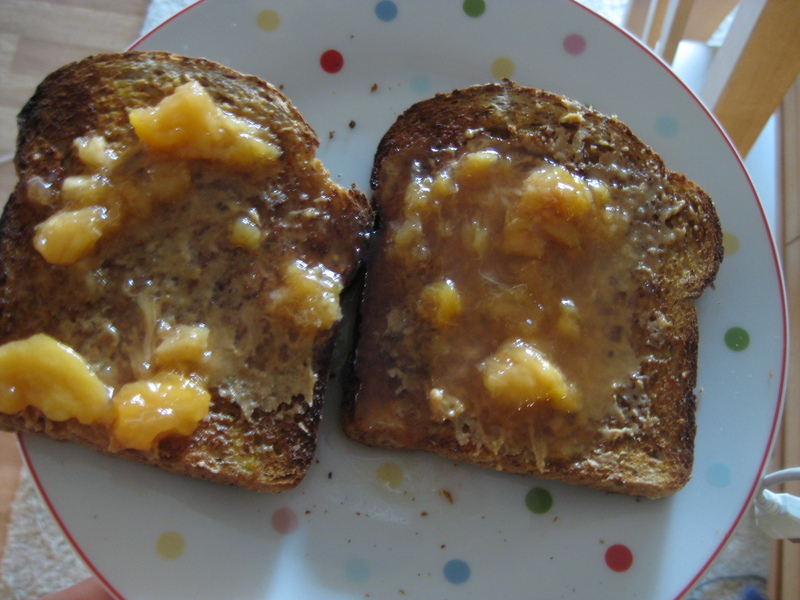 Like I said before, the jam is very watery because it did not set up right from the Splenda. It still tasted great! While running my errands, I stopped at Trader Joe’s to pick up some essentials and came across two great new products. I am not sure how new they are, but they are new to me! #1: Very Mini Vanilla Meringues! They are so sweet and they only have 1 calorie per piece. You really feel like you are having a lot of them if you have like 10-15 and that is only 10-15 calories! I will post a pic soon. #2: Five grain almond bars??? I am exactly sure what these are called because I unfortunatly did not buy them. I was in line checking out and asked the cashier if they were any good because they were on the end cap. He said yeah, and opened a bag so I could try one (very nice of him)! They tasted like a almond gingerbread cookie. I glanced at the nutrition facts and believe it said 4.5 grams of fat and 110 calories. The bar wasn’t small and would be a great snack or dessert! I will let you know when I get some so I can be more exact on the details. First of all, I will get on track with my recipes and my the regularity of my posts starting tomorrow! So watch out! I did want to recap on my weekend though. 1. Peel peaches and remove bruises and soft spots. 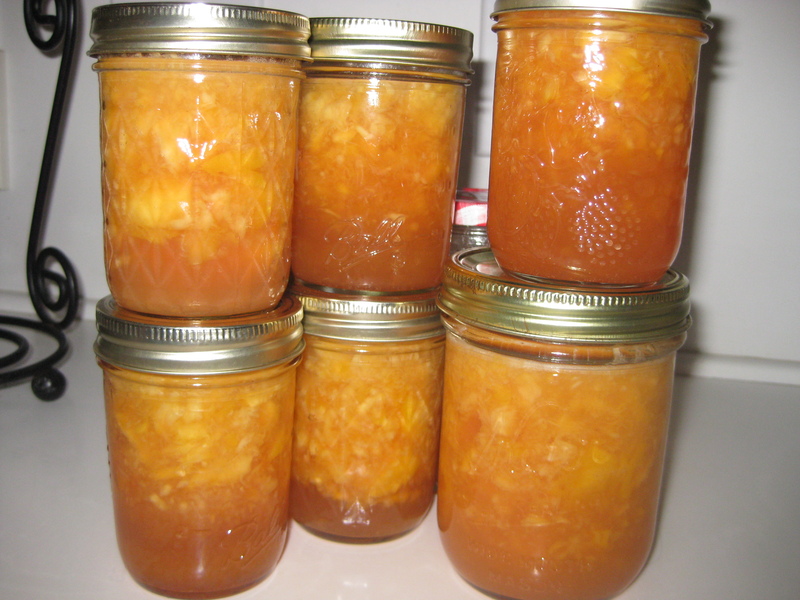 *** A tip in peeling peaches: drop the peach in a pot of boiling water for a few seconds and up to a minute before peeling. When you do this it will make the skin come right off!! 2. Cut peaches into small pieces. Think of what you would like to spread on your toast. If you don’t mind bigger chunks, that’s fine! 3. Measure the correct amount peaches, and put in a bowl. Measure the correct amount of splenda or sugar and put in a saucepan with 1c. of water. 4. Stir the sugar/Splenda until it is boiling and then continue stirring while the mixture boils for 1 minute. 5. After one minute, add the fruit to the hot sugar – removing from heat. 6. Put jam into jars and let cool completely. You can put it in the freezer to store. ** Like I said, the Splenda will cause the jam to not set-up like a jelly would. Freezing helps it to stay together but it is definitely watery. I did enjoy this on my sprouted wheat toast this morning! It was so good!!! Blueberry recap tomorrow and back to some real recipes! !